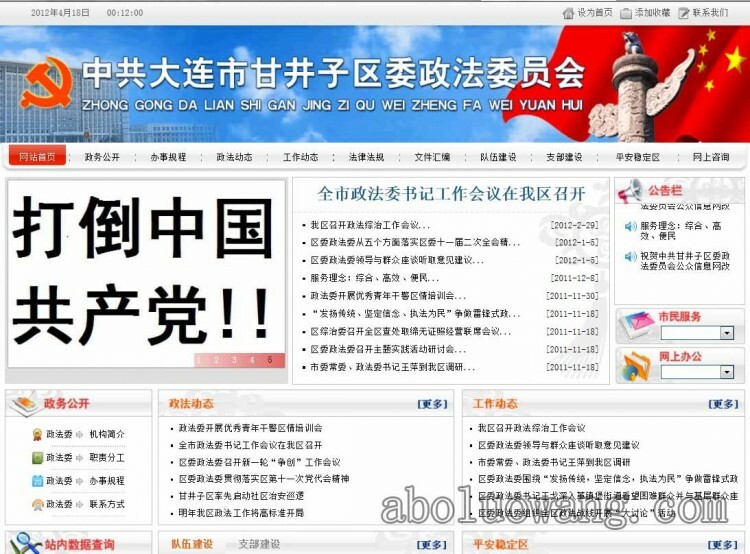 A website belonging to a Chinese Communist Party (CCP) branch in one district of the northern city of Dalian was vandalized on April 18. It is unclear whether the defacement was carried out by external hackers or internal saboteurs. The website belonged to the Political and Legislative Affairs Committee (PLAC) in the Ganjingzi District of Dalian, a city of six million on the coast of the northeastern Liaoning Province. The PLAC controls all police, armed police, courts, and other security forces in China, and is an object of animus among many Chinese for the often brutal tactics it adopts in response to citizen protest. The website, zfw.dlgjz.gov.cn, loaded either slowly or not at all on the afternoon of April 18, EDT. Pictures of the defacement were initially discovered and captured by Apollo Net www.aboluowang.com/, a dissident and anticommunist website run from the United States. It was not possible to contact the defaced Party website. Hacker-activists identifying themselves as “Anonymous” have in recent weeks begun targeting CCP and government websites in China, identifying security flaws, defacing the websites and plundering database material before dumping it online. 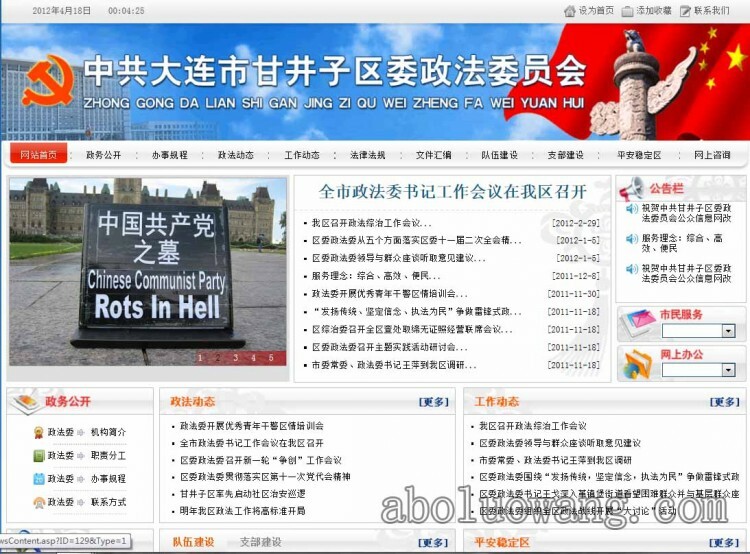 It is unclear whether the attack on the PLAC website in Dalian was an Anonymous operation, or who was responsible. AnonymousChina did not respond to a query through Twitter.